Winstep Forums • View topic - Winstep Xtreme Public Beta 3 released! Post subject: Winstep Xtreme Public Beta 3 released! Winstep is proud to announce the third public beta of Winstep Xtreme. IMPORTANT: Current Winstep Xtreme beta 2 users should upgrade as soon as possible, since beta 2 times out on July 1st 2006. Winstep Xtreme is a change in the direction of the Winstep 2000 Project, one where focus is more on the desktop environment as a whole rather than on individual applications. Although NextSTART and WorkShelf are - and will continue to be - individual applications that can be run independently of one another, they only make perfect sense when run together. The user experience provided by running NextSTART and WorkShelf together proves, without a doubt, that 'the whole is greater than the sum of its parts'. Winstep Xtreme is a brand new product, with a different philosophy, that starts off where the old Winstep 2000 project ended. Unlike Winstep Full Pak, which was just a bundle of our existing products, Winstep Xtreme is the product. Winstep Xtreme is a complete and unified Desktop Environment, composed initially by the next generation of our NextSTART, WorkShelf and FontBrowser products. Although Xtreme won't force you to run NextSTART and WorkShelf together, it will certainly encourage you to do so! Per pixel alpha: this new feature allows incredible eye candy effects and themes that will blow your mind! The Menus, Startbar, Desktop Modules and even WorkShelf itself can now be semi-transparent - or have only parts of them semi-transparent - and blend smoothly with the background. You don't have to wait for Windows Vista: the next generation in User Interfaces is already here. Special FX: lots of new special effects, such as icons zooming in on selection and shifting to make room for an item about to be dropped on the shelf, incredible water ripple effect that makes the shelf behave like a liquid surface whenever you click on it, new sound events for when you empty the recycler or drop a file into it, a mind warping 'ripple' menu animation and smoother menu animations. Individual Hotspot Button bitmaps: Hotspot buttons previously used the bitmaps for the tasklist buttons. This didn't always work very well, more often that not a bitmap would look great as a task button but terrible as an hotpot button - or vice versa. Skinners can now make themes where hotspot buttons have their own bitmaps. Systray Background bitmap: the systray can now have its own individual background when attached to the NextSTART startbar. Sub-theme support: Child menus can now have a different look from parent menus. Couple this with the ability to 'hardcode' specific themes to specific menus and/or hotspots and you have one of the most flexible and powerful skinning engines around. Task Snapshots: the NextSTART tasklist now displays snapshots of the actual windows, which are automatically refreshed to keep the contents always up-to-date. Window snapshots make it much easier to identify a specific document in a task list filled with identical icons. Tasklist Context Menus: CTRL+Right clicking a task button in the NextSTART tasklist displays a context menu from where you can restore, maximize, minimize and close the application and/or all similar windows (i.e. ; all Internet Explorer windows), size or move the window, set the application's opacity level and customize the icon displayed for that window in the tasklist. For the later, you can use either .ICO or .PNG files. Manual task re-ordering: CTRL+Left clicking a task button in the NextSTART tasklist and dragging allows you to place the button exactly where you want it to be. Now you can group your favorite applications in the tasklist just where you want them, without having to worry about the order in which applications are opened or closed. Full Task function Support: every mouse click combination that works on the NextSTART tasklist (e.g. ; left click to restore/bring to the foreground, middle click to terminate the application, right click to minimize and CTRL+right click to open the task's context menu) now also works on Tasklist Menus, Grouped Task menus and on the WorkShelf Tasks shelf. 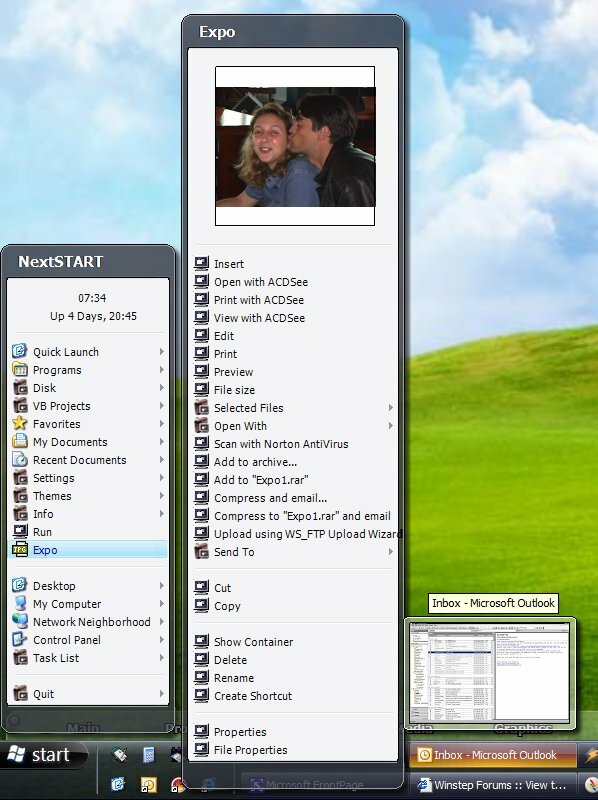 Image and Video Thumbnails: NextSTART's context menus now allow you to visualize image and video files in menus. 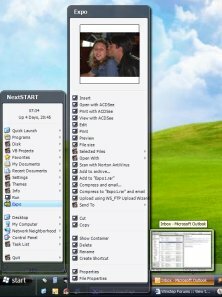 This is extremely useful to help you identify specific files when using NextSTART to browse through your hard drives. 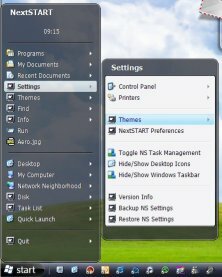 Send To, Open With, context menu options: NextSTART's context menus were already very powerful, but they lacked support for the important Send To and Open With sub-menus, among some others. NextSTART context menus now not only provide all the options you would expect to find on Explorer's context menus as it still manages to add a few more! Shelf-Independent Desktop Modules: previously, when you clicked on the shelf or on a desktop module, all other WorkShelf components came forward as well. Now each module is totally independent from the shelf and the other modules by default - but you can still specify the old behavior, if you prefer. 'Wallpaper' Modules: Desktop Modules can now be 'glued' to the desktop, so that they never cover other windows. Optional 'Auto Arrange' Desktop Modules function: whenever you load a new theme, WorkShelf desktop modules now neatly re-arrange themselves at the right edge of the screen, thus preventing differently sized modules from overlapping each other or even go partially off-screen as it happened before. Desktop Module Animation Support: The desktop Email Checker, Recycler and Wanda modules now support custom animations. This means that the email module can now display a rotating envelope whenever you have new mail, that the Recycler can light up like a furnace when you move items over it, and that Wanda can have a new face. Proxy Support: WorkShelf and NextSTART now provide transparent proxy support for all functions that depend on the Internet to work, like auto update, online cookie retrieval, and weather and email checking. There is no need to configure anything since proxy settings are automatically retrieved from Internet Explorer, but, in case you need it, you can also manually specify Proxy settings. WorkShelf Hotkeys: You can now open, activate shelves and run programs using nothing but the keyboard! Each shelf can have a hot key associated to it, which, when pressed, opens that particular shelf and brings WorkShelf to the foreground, un-collapsing it in the process if necessary. Items in regular shelves can also have key combinations associated to them, which, when pressed, execute the program without the need to activate WorkShelf. All hotkeys are system wide, that is, WorkShelf does not need to have the focus for the hotkeys to work. Reorganized and simplified Preferences: the Preference screens of NextSTART and WorkShelf have been re-designed in a more logical and simplified manner, making it easier for new and previous users alike to find the options they are looking for. Increased Performance: many previously existing functions have been fine-tuned to increase performance. For instance, meters are no longer updated every second unless necessary, processes are only enumerated when new windows are created or destroyed, bitmaps are now cached in memory instead of being constantly retrieved from the file system, window snapshots are only taken when window contents change, etc... All in all, the combination of all these performance improvements give the user a smooth experience when running Xtreme. There are literally HUNDREDS of other new features, changes and fixes, far too many to list all of them here. But this is not all: many more mind blowing features are scheduled to be added before Winstep Xtreme goes final. Become part of the Xtreme experience now! Winstep Xtreme costs $39.90, unless you are a currently registered Winstep Full Pak, NextSTART or WorkShelf user, in which case you should read below. Your purchase of Winstep Xtreme entitles you to one year of free updates for all components of the suite - including new components that might be released in the mean time - with one year renewals costing only a fraction of the original price: $19.95. Anything you download and install while your update subscription is valid will be yours to keep - for life! Remember: you "own" the software that you bought, and you don't have to upgrade if you don't want the new features. Another advantage of the Winstep Xtreme unified approach towards the desktop is that any related applications developed by Winstep in the future, under the Winstep Xtreme name, will also become an integral part of the suite - in other words, as long as your update subscription is valid, you will be able to download, install and keep the new components for free! If you install an update after your one-year subscription has elapsed, you will have a new 30-day trial period - after which you can renew your yearly subscription online by clicking the 'Renew' link in the Registration tab of that application's Preferences window or automatically roll back to your previous, registered, version by clicking on the 'Roll Back' link instead. You can download Winstep Xtreme Here. Winstep Xtreme - extreme power! From now on, anyone purchasing Winstep Full Pak will also receive a FREE Winstep Xtreme key with one year's worth of FREE updates. Become part of the Xtreme experience! You too are eligible to a FREE Winstep Xtreme key, with one year of free upgrades from the date you purchased Winstep Full Pak. Please email Winstep Support with your registration details (name and email address you registered under) and you should receive your free Winstep Xtreme key by email within 48 hours. You can upgrade to Winstep Xtreme for the price of a Winstep Xtreme Subscription Renewal ($19.95). Please email Winstep Support with your registration details (name and email address you registered under) and you will be given the URL from where you can upgrade to Xtreme for the promotional price of $19.95. This offer is for a limited time period ONLY and will be valid until Winstep Xtreme goes final. This third beta of Winstep Xtreme features many additions which, just by themselves, justify upgrading to Winstep Xtreme right now! Many more exciting new features will be added before Winstep Xtreme goes final. Winstep Xtreme final will cost $39.90, but, as a token of appreciation to the support registered users have given Winstep, we will offer a temporary upgrade price of only $29.95. This offer will be valid until Winstep Xtreme goes final. Once you've tried out the first beta of Winstep Xtreme you will be able to decide for yourself if it's worth the promotional upgrade price or not. You get a free 30 day trial version, after which you will be able to automatically roll back to your previous registered version or upgrade to Winstep Xtreme, taking advantage of the $29.95 promotional price. Stick with us and enjoy the ride!